Before getting into how to rock a proper cardigan, let me ease your fear of cardigans making you appear unhip or overly mature. 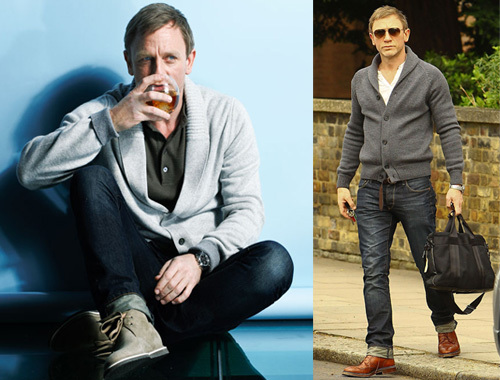 Instead, here are some adjectives I would use in praise of the cardigan: smart, handsome, masculine, respectable, stylish... badass. Yes, badass! ... and "The King of Cool" himself. 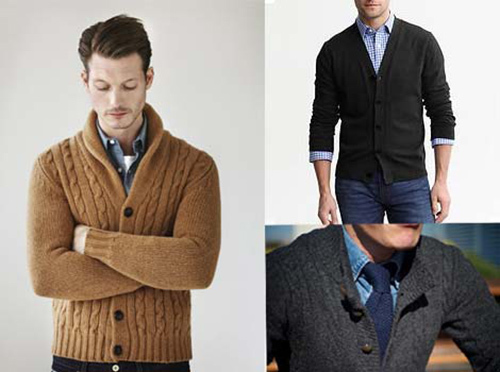 The cardigan is a master of versatility well-worth including in your wardrobe. It’s got the look-feel-warmth of a sweater along with a jacket-like functionality. Worn alone, it’s an excellent option to sportcoats or blazers during transitional seasons. Come winter, it becomes a rich, insulating layering piece worn under coats. A chunky shawl collar cardigan is the perfect style to wear as a stand-alone sportcoat substitute. The heavy knit provides warmth and substantial structure, while the collar mimics the look and feel of a jacket. Some cardigans are a hybrid and come with a lining. Literally called a 'cardigan jacket', it looks just like a sweater cardigan from the outside, but the added lining provides further insulation and wind protection like a real jacket. You can’t go wrong with most colors, but if you want an easy starter that will go with practically everything you own, choose one in a rich but neutral shade of grey, camel, brown or navy. Just like with a neutral blazer, you can either keep the rest of your outfit neutral or pop it with a colored shirt or bold accessories. For more texture and depth, look for cardigans made with either mélanged yarns (i.e., mixed colors and/or fibers), interesting patterns such as cables, or one that has both. This will add dimensionality and up the luxe quotient. More wool content will make the cardigan warmer, softer, richer-looking and often dressier than those made with cotton yarns. Premium fibers like cashmere, especially with a touch of silk, give the cardigan an elegant sheen perfect for finer occasions. Selecting the right cardigan may take a little effort, but what to wear with it can’t get any easier. For casual days and weekends, anything goes. You can pretty much pick out any shirt with your eyes closed, anchored with your favorite pair of jeans. The entire spectrum of tops – from a worn-in t-shirt, henley, polo, to a buttoned sportshirt in any color or pattern – should work beautifully. Lace up a pair of sneakers, thick-soled brogues or rugged boots, or slip on a pair of driving shoes or loafers, and you’re out the door looking boss. When the temperature dips lower, switch to long sleeves under the cardigan or put on more layers, like a thermal undershirt under a button-down, then add a scarf, hat and gloves for more protection and warmth while simultaneously amping your style. For dressier times, make sure the quality of the cardigan matches the occasion as explained earlier. It’s the same principle as wearing a finer jacket to match the rest of your dress clothes. The polished look begins with a crisp, well-pressed dress shirt, tie optional. A dressier look calls for a finer tie, dress trousers and a good pair of oxfords. A dress-casual vibe could use a warm, gutsy tie in wool or flannel, and depending on your preferred level of dressy-casual ratio, paired with clean dark jeans, chinos, or tailored trousers. Finish with semi-dressy shoes like wingtips, derbies, or dress loafers. Caution: Strictly speaking, a cardigan can only go so far to substitute a proper jacket, acceptable only in semi-dressy occasions when a jacket is not required. Nevertheless, you’ll probably have more opportunities to sport a cardigan-as-jacket than you can shake a stick at, as the loosening of dress codes, for good or bad, is on the rise for many previously buttoned-up occasions. This trend, coupled with a growing premium on individual style, makes it a perfect time to rock things your way. What Can a Cardigan Do for You? The cardigan is a great multi-tasker that plays nice with, and elevates, almost anything that you throw at it. The fact that it can be worn through at least 3 seasons (spring, fall, winter, and sometimes even in cool summer mornings and nights) makes it a stylish garment of maximum utility and value. For these reasons, it’s an essential item in any man’s wardrobe – a garment that keeps on giving. But beyond all these benefits, the best part about the cardigan is how it makes you feel, and you’ll know it’s the right one when you feel like a bona fide badass. And that’s what a cardigan can do for you.